Where would the Parkdale Food Centre be without our wonderful community partners and supporters? It was just over 3 years ago that we moved in at 30 Rosemount Avenue, after a fast, frenzied fit-up that transformed a dark, rabbit warren-type space into a bright, welcoming community hub, food bank and kitchen. Never in a million years did we imagine just how busy that kitchen would be! A full time Kitchen Manager, daily breakfast and lunch 3 days per week, weekly cooking workshops, community meals, the list goes on. With the constant and increasing activity came the need for upgrades, repairs, more equipment. Enter St. Matthias Church. For many years, St Matthias had been hosting community meals, once a month at PFC. In February 2016 the St. Matthias Anglican congregation (Parkdale Ave at the Queensway) merged with All Saints’ Westboro (Anglican). 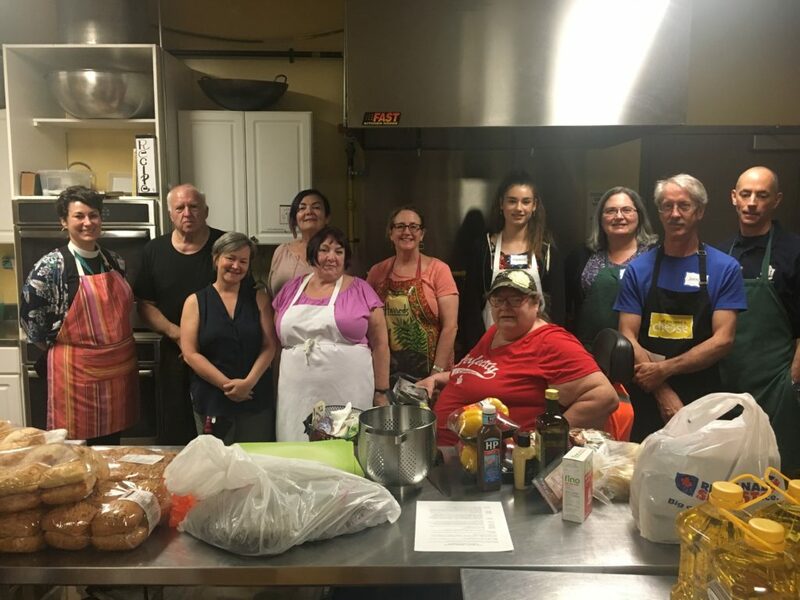 Many long-time members of All Saints’ Westboro joined in with St. Matthias Community Meals volunteer teams and continue to heartily support this legacy ministry of the former St. Matthias Church. Rev Simone Hurkmans, one of the priests at All Saints’ Westboro, along with the Ven Chris Dunn, Rev Dr Linda Privitera and, formerly, Canon John Wilker-Blakley — have all donned aprons and wielded knives or spatulas during our community meals (so they knew the limitations of our kitchen!). In the fall of 2016, they asked us to submit a proposal for funds from the recent sale of their church on Parkdale Avenue. While it was sad for the congregation to leave the St Matthias Building behind, they were delighted to have a portion of its sale price returned to the community in support of PFC. The Parkdale Food Centre is now the proud owner of a fire suppression system (that we hope to never use! ), and a super-efficient dish pit complete with a new-used low temperature dishwashing machine boasting a 60 second cycle, with a new rinse sink and clean tabling. Thank you St Matthias! But it doesn’t stop there. Without a doubt, it would not have been possible without our long-time supporter, Archer Environmental. They are patient, generous, and always willing to help us out. 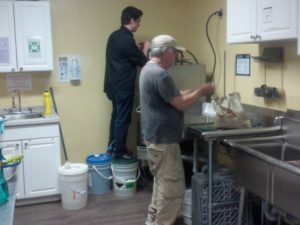 Our new dishwashing machine was donated and installed at no cost. And if you think that was easy, think again. Installing a new dishwasher also meant we needed the rinse sink and tabling to attach to it. Chef Pat Garland to the rescue! As soon as he saw what we were up to, he offered some tabling from his own busy restaurant kitchen. “I’m going to renovate soon anyway”. Seriously, you can’t make this stuff up. Thank you, Chef Pat! Commercial Kitchens. They were able to pick up the tabling, cut it to suit, and bring it back to us; again, at no cost. We are so lucky! Thank you, Blanchfield! We also have some great trades and suppliers that made the implementation of these upgrades look easy. Thank you, Gloucester Electric, Fullarton Plumbing, Shields Mechanical, Andersen Fire, Chubb Edwards, and Russell Hendrix for your great work and professionalism. Our heartfelt thanks and appreciation go out to the St. Matthias congregation for the funds to support these fantastic upgrades. We are so grateful for this help to make our community kitchen more efficient, not to mention safer. Just a note, Lynda. The former St. Matthias Anglican congregation (Parkdale Ave at the Queensway) merged in February 2016 with All Saints’ Westboro (Anglican). Rev Simone Hurkmans is one of our priests at ASW along with the Ven Chris Dunn, the Rev Dr Linda Privitera and, formerly, Canon John Wilker-Blakley — all of whom have donned aprons and wielded knives or spatulas during our community meals. Now, many long-time members of All Saints’ Westboro volunteer with our St. Matthias Community Meals teams and heartily support this legacy ministry of the former St. Matthias Church. While it was sad for us to leave our cherished St Matthias Building behind, we are delighted to have a portion of its sale price returned, with the blessing of our Diocese, to the community in support the fine work of the PFC. Thanks for your comment and the clarification Susan! I have added in these details to the blog post! Next PostNext Why do people come to the Parkdale Food Centre?